To download file, please login or register. The total distance of our route was 41.99 miles (67.59 km). This ride was flat for the first 20 miles and slowly started to ascend for a good 5 miles before the border crossing into Cambodia. The hills were long and some were very steep. 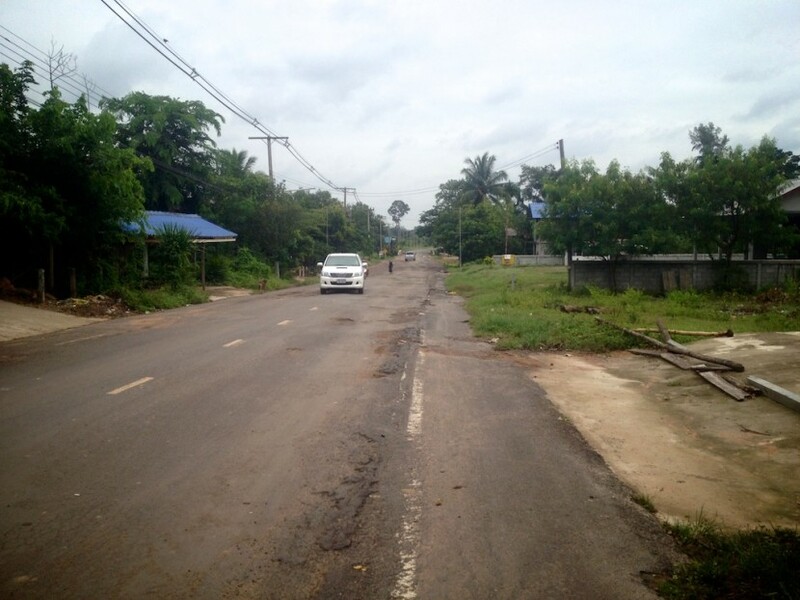 We noticed the road conditions in Cambodia are a bit worse than what we’re used to from Thailand; some sections of road were covered in potholes. It’s hard to tell from this photo, but this road was absolutely riddled with potholes. We marked the area on the map above. A few miles from the Chong Sa Ngam / Choam border crossing, the road started to descend. After the border crossing, its all downhill to Anlong Veng. 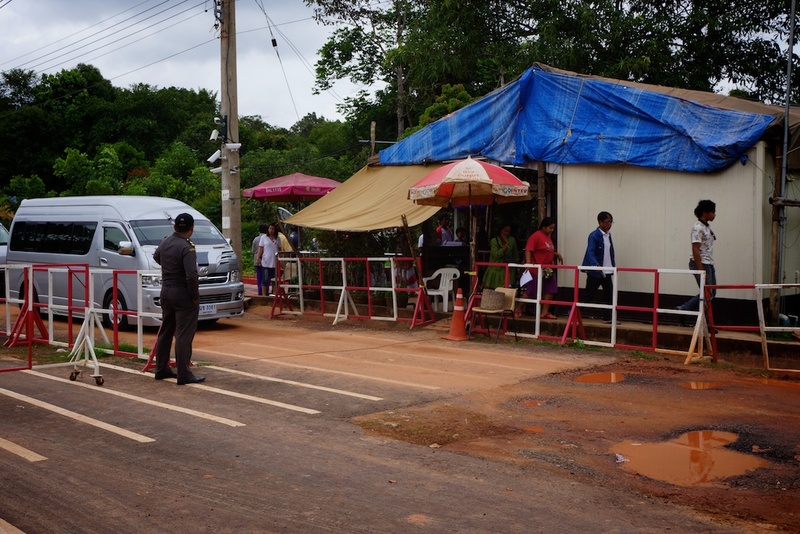 The Chong Sa Ngam / Choam border crossing between Thailand and Cambodia was dead simple. On the Thai side of the border, we rolled through a security check, parked our bikes and jumped in line to get our departure cards stamped. Haley managed to lose hers at a hotel, but it took all of 5 minutes for the border guards to issue her a new one. Once we officially exited Thailand, getting our Cambodian visa on arrival was similarly simple. We provided photo ids, filled out some paperwork, and paid $20 USD for each visa, said “Awkoon” (“Thank you” in Khmer), and were on our way. The whole process took us roughly 20 minutes. For more information about visas for Americans, check out our Visa Requirement Guide. 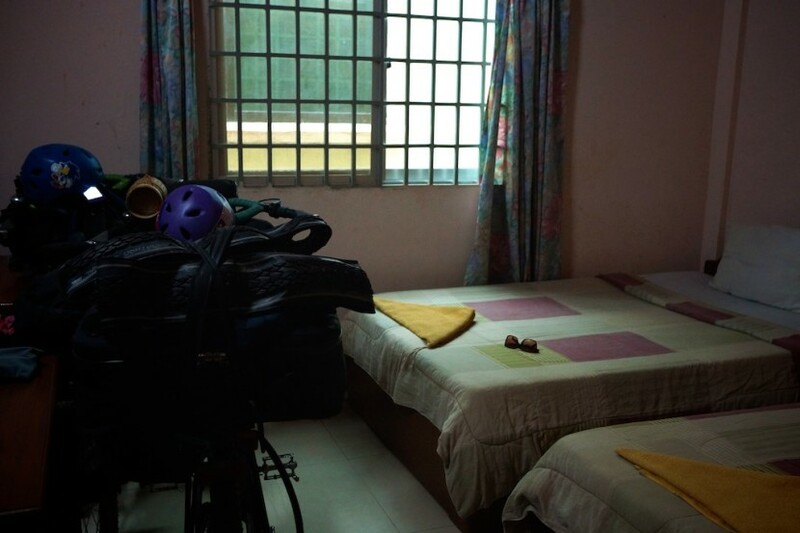 We stayed at Hotel New Lucky Star for $8 USD. Our room had a fan, cold water and good wifi. It wasn’t the cleanest hotel, but it was okay for one night. We were able to take our bikes in the room, which is always a plus. We ate oatmeal and bananas before we left our hotel. Matt was still hungry, so we stopped at 7-Eleven for a sausage and cheese croissant and water for 66 bhat. 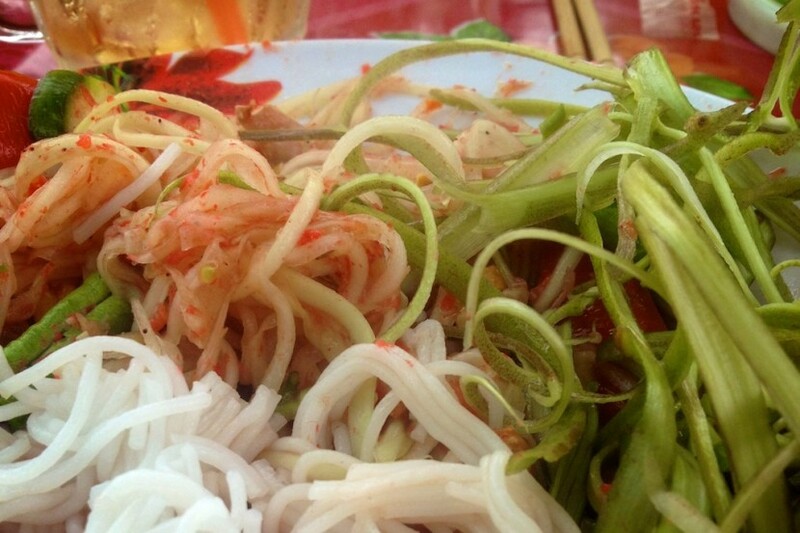 For lunch, we ate at a local restaurant on the side of the road and had 2 delicious papaya salads with noodles for 59 bhat. For dinner we splurged on 2 fried chicken meals and three beers for $12.34 USD. We bought 2 (terrible) bubble teas for dessert for 14,200 riel. One night at Hotel New Lucky Star and all of our meals cost us around $27 USD. Our 30-day Cambodian visas cost another $40 USD. Altogether, our first day in Cambodia cost us $67 USD. The first day in a new country is always challenging; hopefully, it won’t take us long to pick up the basics of the Khmer language and learn the ins-and-outs of transacting in 3 different currencies!